With the general election less than 90 days away, both presidential and congressional campaigns are starting to heat up. Military families might start to feel the need to speak up or get involved in their local campaigns. As with all things in the military, though, there are rules. While these rules only dictate what a service member can and cannot do when it comes to political participation, it is important for families to be aware of them as well. Service members are encouraged to vote and express their own personal views. They are even allowed to share those views with a letter to their local newspaper editor (with a disclaimer) and place regular-sized bumper stickers on their personal vehicles. Partisan political signs are a no-go on military housing though, even if it’s privatized. The key in most of the do’s and don’ts to political participation of service members is to avoid political activity while in uniform, and make sure what you say and do represent only your own personal views and never that of the military. 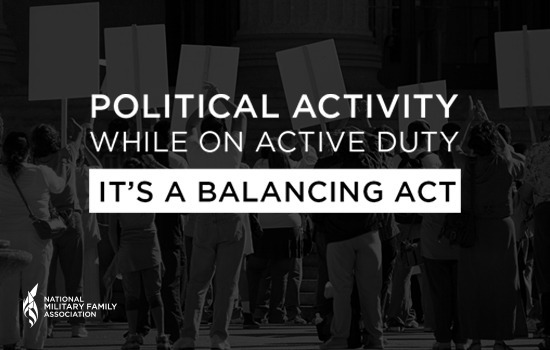 While running for office isn’t allowed, service members must also refrain from almost all partisan political campaign activities. This includes making speeches or attending a partisan political event as an official representative of the military while in their uniform. When it comes to social media sites, both service members and their families should be careful. It’s easy for things to be misrepresented or go viral. A service member is allowed to become a ‘friend’ of, or ‘like’ a candidate, political party, or campaign on social media platforms. Posting personal views and opinions is allowed, but if you are identified on social media as member of the military or can be identified as one, a disclaimer should always be included. This is also very important for military families to remember. If you identify yourself as a military spouse or have pictures that include your spouse in uniform, even though not required, you should include a disclaimer. In the end, the Department of Defense does not have a say in what military spouses or family members can do in regards to their political participation, but even though these rules might not apply, they’re important to keep in mind. Use them as a guideline, and remember that just as your service member’s actions can impact your family the same can be said for your actions impacting your spouse.